Hi everyone! My name is Emily and I am a Masters student in Dr. Chris Lowe’s CSULB Shark Lab. 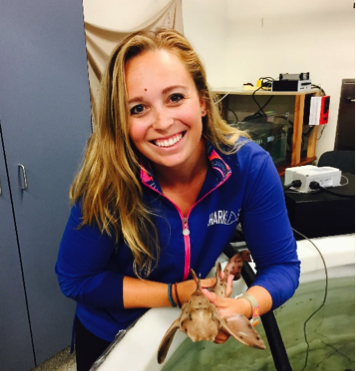 My Master’s thesis aims to characterize horn shark movements and behavior to better understand their ecological role in the kelp forest ecosystem. Horn sharks may not be the most popularly known shark, but they are a very common species in southern California, especially here around the isthmus of the island. Horn sharks are nocturnal, bottom dwelling sharks with two horns used as defense. 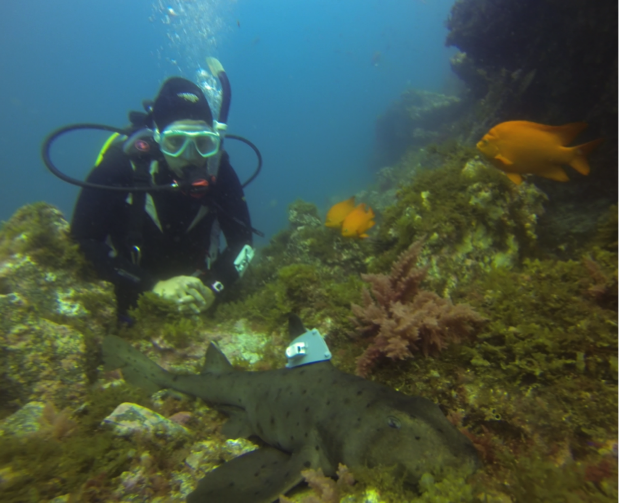 My goals as a Wrigley Fellow are to understand where horn sharks move during their journeys at night and to quantify how active they are, or in other words how much energy they use during a night. By knowing how many calories they burn in a 24 hr period, I can estimate how much food they would need to eat, and therefore estimate their predator impacts in the kelp forest. The intriguing thing about why we care how much these sharks eat is that they are one of the few urchin predators in southern California. Horn sharks have plates of teeth that can crush the urchin, and they have a strong suction force to extract the urchin gonads to eat. 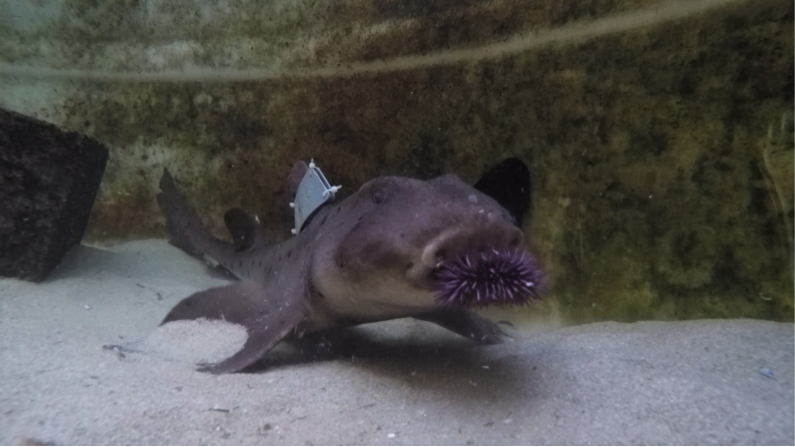 If horn sharks eat enough urchins, they may be important regulators of urchin populations, known as a keystone predator. This matters because urchins are kelp grazers. Therefore, if there are too many urchins in a population with no predators regulating them, the urchins will take over the kelp forest, creating the area into a low-diversity urchin barren. However, horn sharks may help regulate those populations, allowing the kelp forest to grow and flourish. To find out where and how horn sharks spend their time, I created a custom tag package (Figure 1). The first part of the tag is an acoustic transmitter that pulses every 2 seconds, and allows me to follow the shark in a boat (what we call tracking) while listening to the pulse to know where the shark is. The second part of the tag is an accelerometer data logger which records the sharks 3D body movements, as well as ambient water temperature and depth. Put these two parts together and I can determine where sharks are, what they are doing in those locations (i.e., swimming, resting, eating), and also have an idea of the environment the sharks are in (Figure 2). Custom tag packages for horn sharks. On the left is the acoustic transmitter, on the right is the accelerometer data logger. The tag is zip tied tight to the sharks fin, allowing the tag to stay on for 48 hours without piercing the fin or staying on permanently. The most challenging part of field work is tracking these sharks at night. I follow the sharks for 48 hrs from our whaler. During the day, the task is easy since they stay under a rock sleeping, but as soon as sunset occurs, the shark is on the move and the real work begins. The summer here at Catalina has many perks, however warm summer nights are not one of them. It’s cold, it’s dewy, but it’s also a fun adventure to see where each shark will go, how far they may travel, and how fast they can get from reef to reef. Last summer, I did nine 24 hr tracks, and this summer I have done six 48 hr tracks (4 more to go!). So far, I have learned that these sharks can move quite a bit more than expected. Many think the horn shark is a lazy shark because of their nocturnal and bottom dwelling behavior, but when they get moving they sure do know how to cruise and take off! In addition, using the acceleration data I have started to model how these sharks spend their time in regards to water temperature. Most of the sharks dive to relatively deeper, colder water before coming back to warmer, shallower water. The cold and warm temperatures can affect the sharks physiological processes (i.e., metabolism, appetite) so in order to offset the costs of traveling long distances, they may be behaviorally thermoregulating between different temperatures to speed up foraging rates, and slow down digestion rates to maximize energetic gain. There’s no way my Master’s thesis would be possible without the Wrigley Fellowship. Having the convenience to live on the island and live in the horn sharks backyard is extremely helpful to get a sense of how these sharks move among all the different reefs in the isthmus area. I still have a few more tracks to complete before summer is over, and much to analyze, but it is rewarding to see the bits and pieces of the story of horn sharks come together and be able to better answer questions about their role in the kelp forest. This entry was posted in Graduate, Wrigley Institute on August 28, 2017 by Jessica Dutton. By: Casey Barr I am a graduate student in the Department of Earth Sciences at USC, and an environmental microbiologist in the laboratory of Dr. Ken Nealson (who was recently appointed Director of the Wrigley Institute). This summer, my research has focused on the site-specific variability of an electrode cultivation technique pioneered on Catalina through the Wrigley Institute. With this technique, we are able to select for and enrich bacteria capable of extracellular electron transport from marine sediments. The main question I wanted to investigate this summer was: how does our technique work using the sediment of three different sites within one ecosystem? First we had to get our sediment, which is a lot easier said than done. Jasmine (my dive buddy) and I spent 3 days collecting sediment from various areas of the Big Fisherman’s Cove on SCUBA. 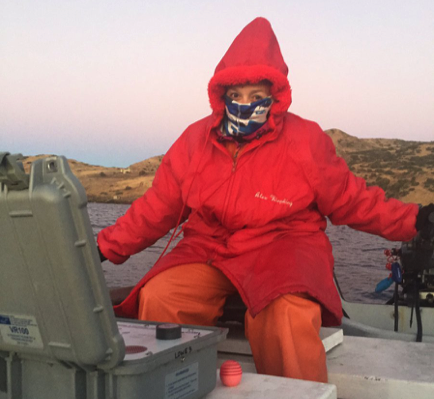 We dive down on the various study sites armed with 5 gallon buckets, hand trowels and a lift bag. 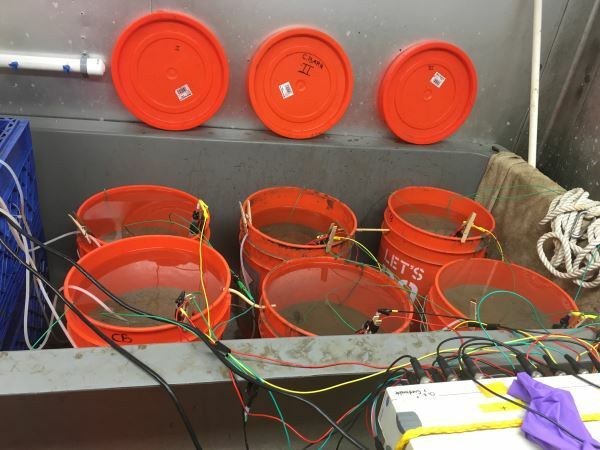 Using 15 gallons of raw sediment from each site, we sieve the samples on shore. Sieving the samples allow us to remove any shells, rocks, or debris that we collected, resulting a silky fine grain sediment, perfect for our electrode technique. Depending on the site, we can end up with between 6-10 gallons of fine grain sediment for every 15 gallons collected. 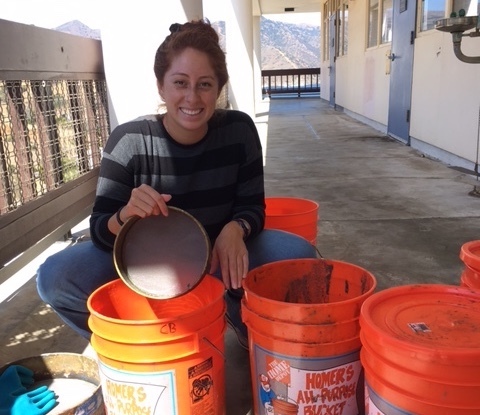 Field assistant and dive buddy Jasmine H. with sieving equipment. Once we have our sediment sieved, I bury glass electrodes into the sediment and walk away for a few weeks while the sediments “settle and establish”. In nature, sediments become layered with different types of bacteria living in different sections based on what kind of chemicals they eat and breathe. By allowing our sieved and mixed sediments to settle, we can mimic the natural gradients and layers that exist, creating a microcosm or micro-habitat in a bucket. A few weeks later, I connect the buried electrodes to a potentiostat, which is a machine that allows us to control the potential of the electrode (basically making the electrode a buffet for our EET bacteria!). Currently, I am running two potentials, one of which the bacteria can use as an electron source (similar to eating), and one that allows the bacteria to “breathe” using the electrode as an electron sink. 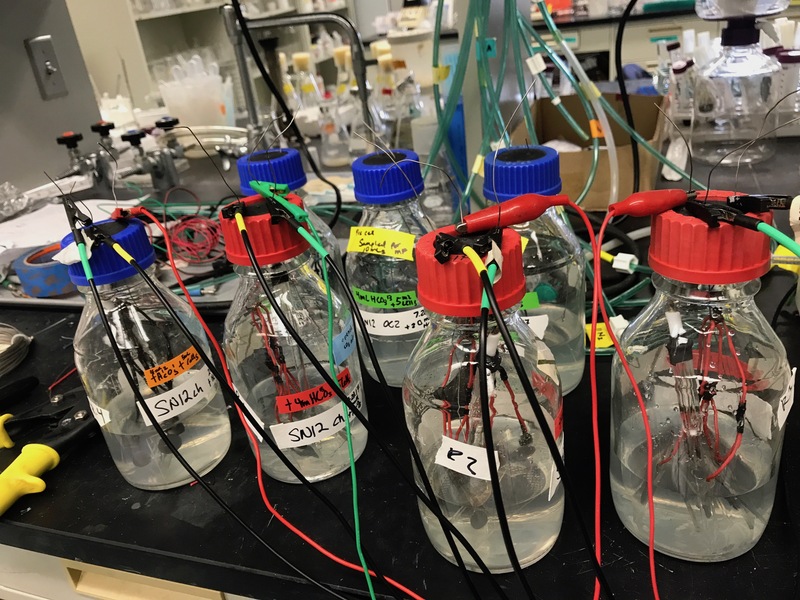 In the past, this method has allowed us to enrich and isolate over 20 novel bacteria strains, making electrode enrichment a great technique in cultivating hard-to-grow bacteria. In addition to the enrichments, I have also been working with some of the previously isolated bacteria in an attempt to determine if some of our strains are capable of fixing carbon – using CO2 to make biomass, just like plants – while using an electrode as an electron source. These experiments will hopefully prove that some of our strains are actually growing on the electrodes, something that has not been done before. If we can find bacteria that are capable of growing on electrodes, they would be great candidates for applications such as bioremediation (the use of organisms to break down hazardous substances into less toxic forms) and biosynthesis (such as production of electricity and other valuable products). This entry was posted in Graduate, Wrigley Institute on August 24, 2017 by Jessica Dutton.